A good Nalgene bottle is an important piece of gear to carry with you on any outdoor adventure. Not only are they useful for helping you stay hydrated, but they can also make a handy storage container, help you wash up at the end of the day, or be used in a number of other ways. 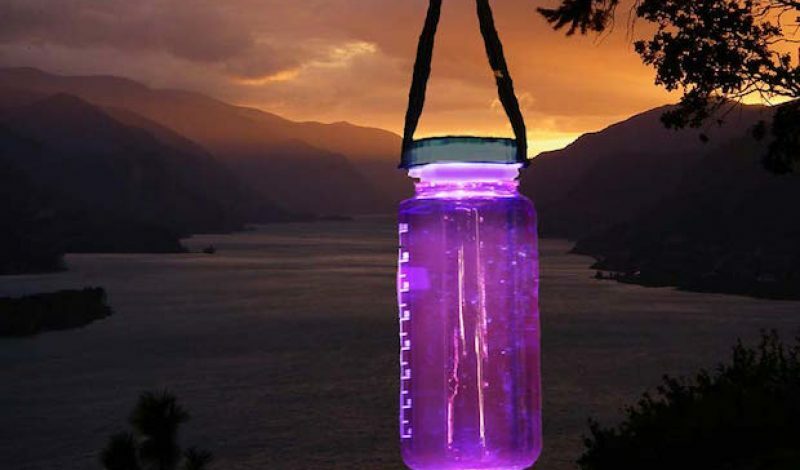 And, if you add the Lightcap to the mix, your favorite sticker-covered BP-free water bottle can even transform into a solar powered lantern. This product is a 2.9 oz. high tech cap with has a solar panel on the topside and four super-bright LEDs in a sealed housing underneath. That housing has threads running along its interior, which allow it to fit any 2.25” diameter bottles including those made by Camelback, Nalgene, and others. It also comes equipped with a swiveling retaining ring that to attach a lanyard or carabiner, making it easy to clip your bottle to a pack or belt. The Lightcap is powered by a NiMH battery that when fully charged can last up to four hours, and can be re-energized during the day via the built-in solar panel. The cap is purported to last 3 to 4 years with normal use, and the LEDs are rated with a burn time of 100,000 hours or about ten years. Operation is simple. The sealed button can be easily activated – even while wearing gloves – and has three settings; off, on, and an automatic mode that illuminates the lights when the surroundings become dark. The retaining ring features a variety of holds that can fit a small lanyard, and the top solar panel removes with a screwdriver to grant access to the user-replaceable batteries. The threads on the cap are made of a malleable material as well, allowing them to screw down tightly onto slightly different sizes of bottles, which makes it easy for you to switch it between any that you might have in your collection. This is a very cool idea that fast packers will probably love since it can save a few ounces by making the gear that you carry more versatile and multi-purpose. And since it costs less than $17, you won’t break the bank buying one either.